wait for it: a new season is coming! Does anyone remember Inigo Montoya from “The Princess Bride”? At one point, Westley tells him that he’ll just have to wait, and he replies “I hate waiting!” Me too. I always think that now is the best time. Well, maybe not always, but LOTS of the time! For some time, over a year maybe, I’ve had a sense that a change of season is coming to my life. This knowing inside brought encouragement that the Lord was speaking to my spirit and excitement over a “new thing” (In Isaiah 43:19, the Lord exclaims: “Behold, I shall do a new thing – even now it shall spring forth!” I can sense the excitement coming off the page in that favorite verse!). I don’t mind change – I welcome an opportunity to grow! Of course, as is to be expected, there was an opposition: while my spirit was cheering, my “natural man” was becoming discouraged and dissatisfied. “Wait for it? Why do I have to wait for it? How long do I have to endure this current season in order to get to the new thing?” I found myself growing unhappy with my current season – when in all honestly, my current season is pretty happy, not a time to merely endure! I began to seek the Lord. I praised Him for the insight, and expressed gratitude for His speaking to my spirit. I recalled that the Lord confides in those who fear Him (Psalm 25:14) and was quietly humbled by the thought that He would consider me. Mostly, I asked for forgiveness, though. I remembered also that godliness with contentment is great gain (1 Timothy 6:6), and I knew that the contentment part was just as much my responsibility as the godliness part: a discontented spirit indicated that I had taken a step in the wrong direction. I told the Lord how encouraged I was to be reminded over again and so personally that He had a plan for me (Jeremiah 29:11), but I confessed that the knowledge was making me unhappy today. Where had I gone wrong? Gently the still small Voice came again: “the vision was yet for an appointed time” (Hab. 2:3). It was meant to encourage me that I had a hope, not discourage me that I hadn’t gotten to it yet. What was I supposed to do today? Rest in Him, comforted in the knowledge that He is in charge of my today and my tomorrows. Find joy in His presence (Psalm 16:11), and be just as content with where I am now as in the knowing that I am on my way to a new place. 4 This is what the Lord Almighty, the God of Israel, says to all those I carried into exile from Jerusalem to Babylon: 5 “Build houses and settle down; plant gardens and eat what they produce. 6 Marry and have sons and daughters; find wives for your sons and give your daughters in marriage, so that they too may have sons and daughters. Increase in number there; do not decrease. 7 Also, seek the peace and prosperity of the city to which I have carried you into exile. Pray to the Lord for it, because if it prospers, you too will prosper…..
10 This is what the Lord says: “When seventy years are completed for Babylon, I will come to you and fulfill my good promise to bring you back to this place. 11 For I know the plans I have for you,” declares the Lord, “plans to prosper you and not to harm you, plans to give you hope and a future. 12 Then you will call on me and come and pray to me, and I will listen to you. 13 You will seek me and find me when you seek me with all your heart. 14 I will be found by you,” declares the Lord….” (Jer. 29:4-7, 10-14). You see, the Lord knew exactly where His people were, and He knew where they were going – but there’s a big in-between time in there! What were the instructions? Build homes and LIVE. Plant gardens and EAT. Have children and give them in marriage. Seek the peace of their NOW, and the Lord would come back – and He would come back with His plans and all the good things they were hoping for. It was that hope that tied them to the Lord, like a cord pulling them forward. This hope didn’t only keep them close to a word or to a promise: it kept them close to the One Who gave them that promise, and His presence was a comfort in the in-between time. Every time the Lord speaks to me, He always comes in agreement with His word. It’s so important to know the Word of God intimately, as it is the record of His character. I was to find contentment in His presence NOW, and let the encouragement of his word to me be two-fold: encouraged that I was on the right path today and encouraged that this path would lead me to my next season. 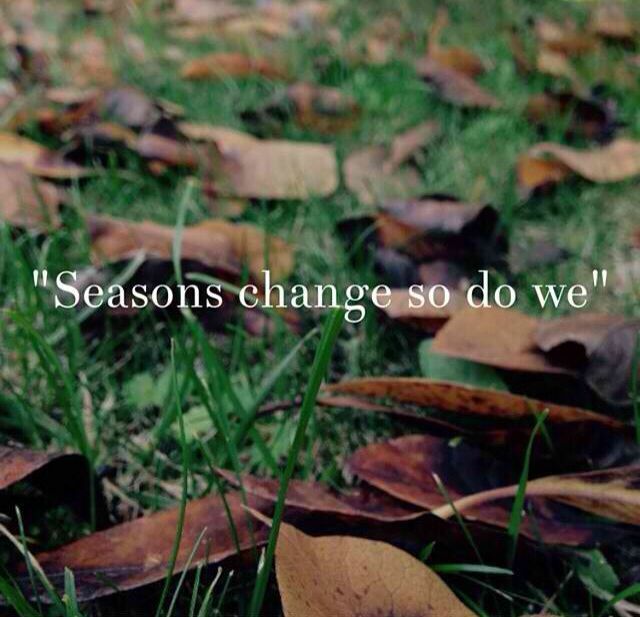 Are you changing seasons too? Be encouraged that the Lord led you to your current season to lead you through to your new season…. and after that, there will be another new season – if we are continually growing, we are continually changing! Following the Lord is the treasure: don’t hold too tightly to the right-now or to the promise of the future: hold tightly to His presence and that treasure will always be yours. ❤ Find blessings in today!